Garrett W. Nichols calls for a rethinking of the classroom as space for disrupting heteronormative discourses—discourses that Nichols links to settler colonialism—to open a space where we can hear, or sometimes re-hear, queer voices. Settler colonialism is a heteronormative project that relies on rhetorics of reproductive “inheritance” to naturalize the erasure of indigenous cultures. Pedagogies attuned to the realities of heteronormativity and settler colonialism require a pedagogical commitment to interrupting these discourses, especially in institutional structures whose existence relies on and supports settler ideologies. Queerscapes, per Gordon Brent Ingram, are spaces and planes of queer alliances formed within and overlapping with heteronormative spaces; the university classroom, with its imbricated personal histories, institutional memories, and power dynamics, is always-already a queerscape. Importantly, the classroom is also a “settlerscape,” composed of the multiple subjectivities that constitute modern settler society and made meaningful through histories of indigenous displacement. Recognizing this dynamic opens a space for unheard queer voices, argues Nichols, and lets us “re-hear” how non-queer stories and perspectives are made meaningful through their unspoken proximity to queerness and colonization. 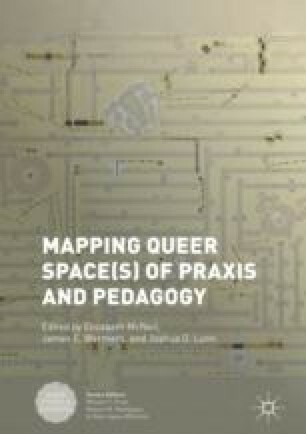 Nichols proposes a decolonial queerscape pedagogy that foregrounds the marginalized and oppressed identities that populate every classroom, while also denaturalizing the supposedly “natural” and “inevitable” rhetorics of heteronormativity, white supremacy, and settler colonization that inform the American academy.